ALEX AND ANI creates meaningful, eco-conscious jewelry and accessories to positively empower and connect humanity. We share a passion for the well-being of our planet, our communities, and our individual paths. ALEX AND ANI is DESIGNED TO CONNECT YOU to the things you adore, the causes you support, and the symbols that inspire. Headquartered in Rhode Island, our products are proudly designed and crafted in America and made with love. 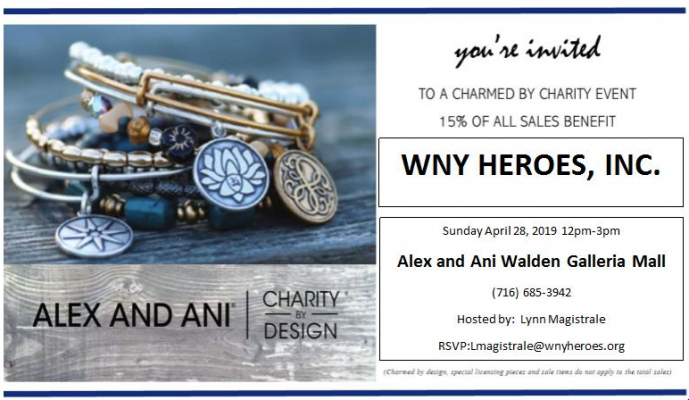 Join ALEX AND ANI for their Charmed by Charity event with WNY Heroes from 12:00pm until 3:00pm on Sunday, April 28th! 15% of sales benefit WNY Heroes! See ALEX AND ANI for more details. Join ALEX AND ANI for their Charmed by Charity event with A PURR-Fect Fit Animal Rescue and Adoption from 12:00pm until 3:00pm on Saturday, April 27th! 15% of sales benefit A PURR-Fect Fit Animal Rescue and Adoption! Take 20% OFF new spring pieces at ALEX AND ANI from Friday, April 19th until Sunday, April 21st! 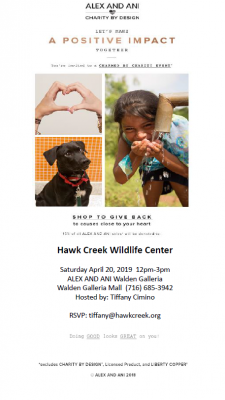 Join ALEX AND ANI and Hawk Creek on Saturday, April 20th from 12pm-3pm! 15% of sales will go to Hawk Creek Wildlife Center!